Leslie A. Robinson. Photo courtesy of Brownstown Police Department. Brownstown police say they found a driver asleep behind the wheel near the entrance to the Jackson Washington State Forest. Officers were called to the scene on State Road 250 on Sunday evening and found the vehicle being driven by 63 year old Leslie A. Robinson stopped in the middle of the road. 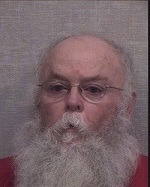 Robinson allegedly had a blood alcohol level of .284 percent, more than three times the legal limit. Robinson was taken to Schneck Medical Center and then to the Jackson County Jail at about 9:13 p.m. that night on a preliminary charge of operating a vehicle while intoxicated.